Discover the secrets of the ocean floor, soar through space, discover the hidden corners of famous museums or tiptoe through the house where Cervantes lived — all without getting up from your chair. Google Expeditions are virtual reality (VR) tours designed for the classroom, and the app is now available to educators and students in Spain and the rest of Europe. Photos and 3D imagery become reality through simple cardboard viewers, which kids can assemble in class. Each adventure comes with detailed descriptions and points of interest, and offers suggested questions so teachers can easily integrate them into the day’s lesson. Teachers guide the experience, from choosing the day’s journey to setting the pace. They can direct their students’ attention to the relevant areas or choose to let them explore on their own. In "From the Stratosphere," children can watch as a helium balloon is sent into space to gather panoramic images of Earth. "Undersea Expedition" opens a window onto the ocean depths and some of the world’s most fascinating coral reefs. And, in honor of this year’s Cervantes celebrations, we worked with experts to develop VR collections dedicated to the author and his work. Now, kids can virtually experience four brand new journeys to some of the places where Cervantes lived and traveled, like his birthplace in Alcalá de Henares, the navy port at Lepanto and the huge windmills that inspired Don Quixote's adventures. All of our Expeditions content comes from collaborations with cultural institutions around the world — National Geographic and the Guggenheim, to name a few. But for this launch, we’re particularly proud of the partnership between Google Arts & Culture and Spain’s National Museum of Natural Sciences, which resulted in a unique virtual tour of the museum. We partnered with the regional Ministers of Education in Castilla y León, Andalucía and Castilla-La Mancha, who wanted to host and support the launch, and raise awareness of the tool. 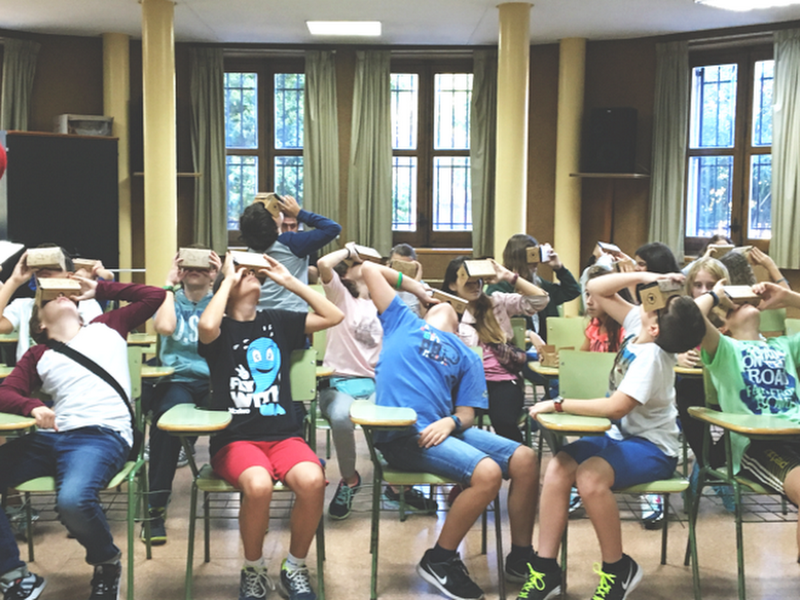 To celebrate, our Google Expeditions team went on a one-month tour to Barcelona, Madrid, Seville, Toledo, Valladolid and Valencia, reaching more than 2,500 Spanish children.